From the first moment I saw the clear icy depth of a strand of rock crystal beads, I was smitten. 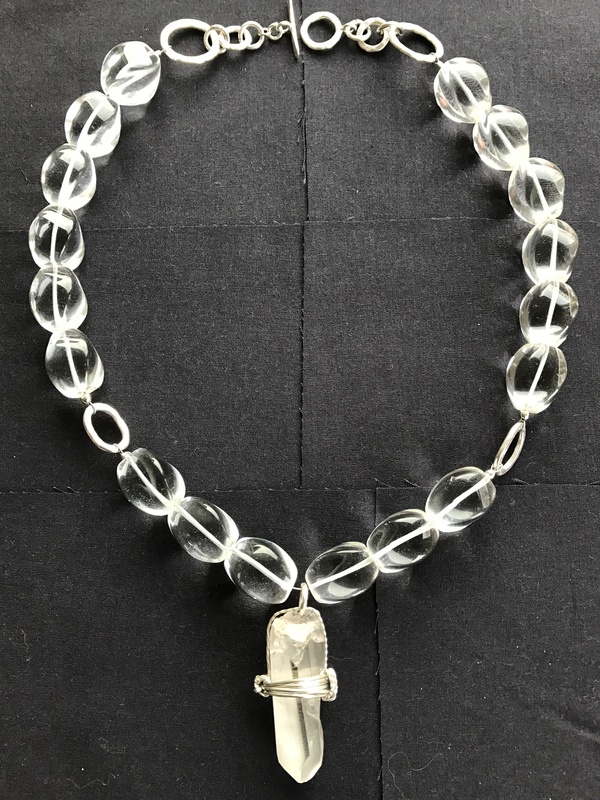 I soon discovered everyone else is too since rock crystal, or quartz crystal, has metaphysical powers: it is a conductor of energy; it is used for healing and meditation. My most favorite pairings for rock crystal are sterling silver or pearls. I designed this necklace with hammered sterling circles and ovals plus a clasp by the same artist. I found a small supply of this nice sterling while searching for something else and they practically flew over to the rock crystal strand I had chosen to be the representative of Drawer 3. Necklaces often evolve that way for me! The centerpiece is a crystal prism encapsulated in sterling silver wire, wrapped by my www.hullartists.com friend, Terry McMahon, who can be found at www.treesasstudio.com. OOOH I like this one too. Did you get my email on the land? Thank you, wonderful gals, for your inspiring comments! This one is my favorite so far. Love that you gave yourself this challenge PKB! Looking forward to see what “mah-velous” creations come forth each week. Supah hearing from you! Glad you remember your Boston-ese!